The terms kitesurfing kites and kiteboarding kites can be used interchangeably, Some would say that kitesurfing refers to surfing with a kite and kiteboarding is for using a wake-style board with a kite but either one is correct. And many kites are multi-purpose and can handle the surf, chop and flat water these days. There are two main types of kitesurfing kite categories. They are typically either foil kites or leading edge inflatable (LEI) kites.They work almost the same but with a few key differences. 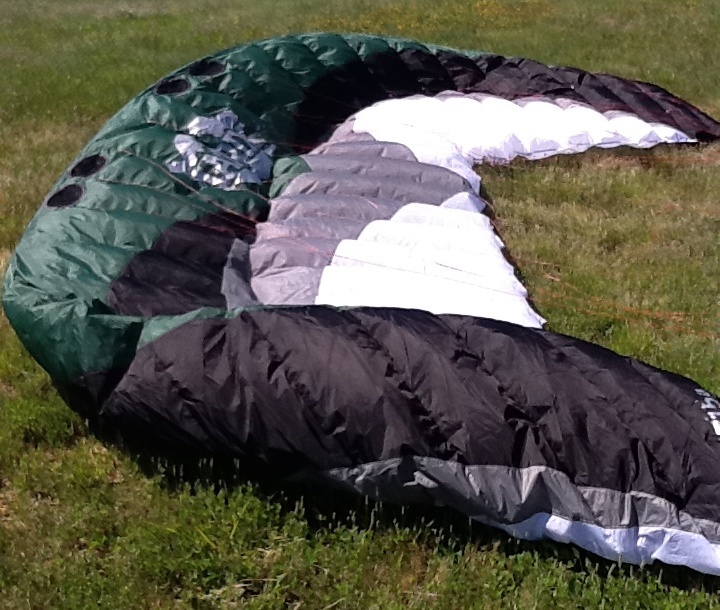 The LEI kites havea an inflatable bladder and struts to pump up. This is what gives them their rigid structure and allows them to relaunch on water so easily. The other type of kites are foil kites which are more like a parachute or paraglider that has individual cells which the wind will fill up with air in order to create the wing structure. For LEI kitesurfing kites, the bladder that can be pumped is a main bladder that fills the front or leading edge of the kite. Between 3 to 7 individual bladders (called struts) connect the leading edge of the kite to the trailing edge. Once inflated, these bladders will give structure to the kitesurfing kites. When carrying any of the kitesurfing kites, they can be carried while inflated upside down and the wind will keep them "floating" along against the wind. The kitesurfing kites we carry are 4 line kites. A few companies still make 5 line kites which were needed a few years ago, but the 4 line kits of today have no trouble relaunching (and that 5th line isn't there to tangle) . LEI kitesurfing kites do relaunch easier than foil kites on water in most cases and that is one of the reasons most professinal kitesurfers use LEI kites. Foil kites are know to excel at land-based power kites. Any one who is serious about landboarding, kite buggying power kite flying uses a foil kite. They also pack smaller and are lighter so kiters can use a smaller foil kite than they would LEI kite in most confidtions. Foil kites have strategic openings where the wind can enter the kite. Because of the positive pressure and the exits on the trailing edge being smaller, the kites will form a very structured wing that provides the lift needed to pull the kiteboarder. Usually kitesurfing kites for water are inflatable kites with the expeption of a few foil kites for HQ kites. 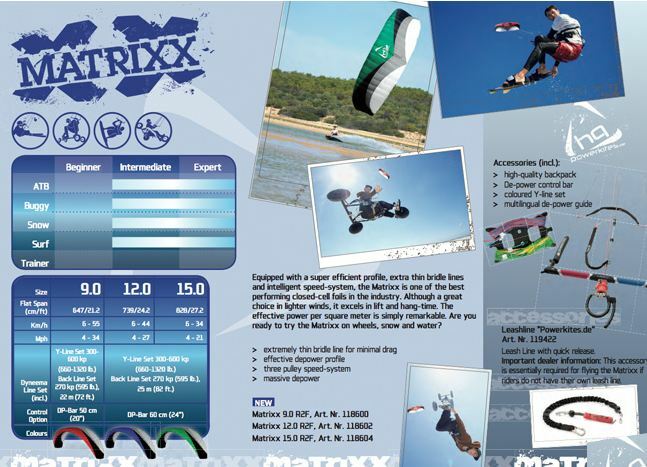 Their HQ Matrixx is a cross-over kite which does great on water, land and snow. Kitesurfing kites are measured in square meters or the total area of the kite and range from 4 meters to about 20 meters. The smaller kitesurfing kites are used mostly for training and allowing the rider to get used to how the kite moves as well as very high winds. Whatever kitesurifng kite you choose, rest assured that we have tested everything out there and only bring the highest quality kite to you whether you want to surf waves, do wake-style tricks, cruise across the bay or freeride and launch big jumps. Kitesurfing is an adrenaline-fueled sport that creates a sensation of freedom. 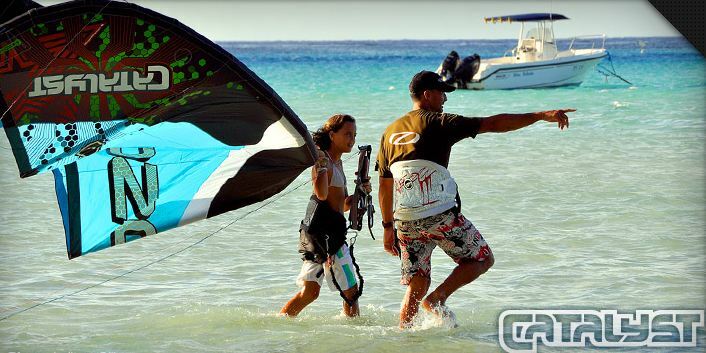 Most riders that get started get hooked (or unhooked) for life on kitesurfing kites!